Congratulations to all who voted for O Brother, Where Art Thou, making it OnRecords’ most favourite soundtrack ever! Probably my favourite fun fact about this winning soundtrack is that its recording actually began before filming the motion picture. This probably helps explain my decision to place it in the “Musicals” category, even though it was one of the few that haven’t been turned into a Broadway show (it’ll probably happen eventually though, right?). So much more than a great soundtrack, O Brother has become like a curator, introducing many to early American folk music. I wouldn’t be surprised if the film is credited with the rise in popularity of folk instruments in the past 15 years, as well as successful bands like Mumford & Sons, The Lumineers and The Avett Brothers. But I digress. When we press play on this album, it begins with a loud crackling noise – the sound of a log being chopped – which becomes the downbeat for “Po’ Lazarus”, the work-song recorded by Mississippi prisoners in 1959. This track accompanies one of the coolest stories behind this album: former inmate James Carter (who is credited as the lead vocal on the song) was presented with a cheque for $20,000 and when the soundtrack was nominated for a few Grammys, he attended the award ceremony in 2002, one year before his death. The next track, Harry McClintock’s “Big Rock Candy Mountain”, is the only other compiled and pre-recorded song on the album. Since its recording in 1928 this song has been covered by many and even cleaned up for children a few times. But luckily we get the uncensored hobo’s paradise, complete with “lakes of Whiskey” and “cigarette trees”. It really sets the tone, for the rest of this old-timey soundtrack.. The rest of the tracks are a collection of traditional folk tunes brilliantly chosen by T Bone Burnett and re-recorded by a variety of country, bluegrass, and blues musicians. First up is Norman Blake’s rendition of the classic “You Are My Sunshine”, beginning with the saddest verse to temper the mostly light and sweet melody. Next up is the radio version of the plot-central track, “I Am a Man of Constant Sorrow”, which will show up a few more times before the album is done. This particular version (with lead vocals by Union Station’s own Dan Tyminski) is stripped down to vocals and acoustic guitar, reflecting how the recorded it in the film. The country music is broken up a bit with “Hard Time Killing Floor Blues” by ever-smooth bluesman Chris Thomas King before launching back into “I Am a Man of Constant Sorrow”, this time as an instrumental acoustic guitar solo. After the perky “Keep on the Sunny Side”, Alison Krauss returns, first with one other female bluegrass legend, and then with two: Gillian Welch joins her on the theologically-problematic but emotion-lifting funeral favourite, “I’ll Fly Away”, before Emmylou Harris joins both women to complete the country vocal trifecta on the dirge-like lullaby, “Didn’t Leave Nobody but the Baby”. Cutesy and chipmunk-y, “In The Highways”, is followed by what is possibly my favourite track on the album, from the Cox Family, “I Am Weary (Let Me Rest)”. Then, another instrumental of “Man of Constant Sorrow”, this time on violin, sets us up for Ralph Stanley’s haunting a cappella rendition of “O Death”. The fictional singing group of the film, The Soggy Bottom Boys, return for an encore, and give us “In The Jailhouse Now,” as well as a full band version of our favourite theme song, which has an official music video that acts a bit like a film trailer/summary. Good luck not watching the movie after this. The album closes out with two traditional folk tunes, first an a cappella and bass-heavy “Lonesome Valley”, and second, the Stanley Brothers’ old-time-country, mandolin accompanied “Angel Band”. There doesn’t seem to be a great way to finish off this throwback to old school American music, so the soundtrack ends there, not with a memorable moment from the film, but with a simple gospel folk tune about preparing for one’s death. I think O Brother is such a clear favourite because it is not only a great collection of nostalgic tracks or a memorable keepsake from a great film, but because of the way the music transports us to a different time and place, covers a lifetime of emotional highs and lows, and if we’re lucky, we return to our own world with a new perspective. With or without the visuals of the movie. …But if you haven’t yet, you should probably still see the movie. “Poison & Wine” became their first widely received track, having also had play during a Grey’s Anatomy episode – I should really start watching that show just for the exposure to emotion-packed songs by new artists. Soon enough however, I was listening to their whole album, Barton Hollow, and most thankfully, my roommate Beth bought it on vinyl when we got to see them live at The Vogue in November. So, here I am, on my day off on the morning after the Grammys, fully expecting to do a Whitney tribute blog, or maybe finish off the Billy Joel one that’s been sitting in my drafts for a week, and all I can think about is The Civil Wars. And apparently I’m not the only one, with Barton Hollow climbing back up to the #5 download on iTunes this morning! So I slip Side 1 over the post and settle onto my couch, with ears perked up. “20 Years” introduces us to Barton Hollow – a place full of stories – and to what The Civil Wars do best: soft and subtle harmonies over a lullaby-esque picked acoustic guitar. The story is simple yet compelling, speaking of a 20-year-old note on “yellow paper” waiting to be read and responded to. Although this record was made in 2011, I sometimes feel as though Barton Hollow is that old letter slid under my door, and I am unfolding it to discover old secrets and truths of a stranger. Next is one of the album’s few more perky tracks, “I’ve Got This Friend”, which was on regular rotation on my summer playlists this past July and August. Probably my favorite matchmaking song… not that I can think of any others (without including “Matchmaker” from Fiddler on the Roof). Since seeing The Civil Wars perform live, I can’t help but picture Joy bouncing along to this song like she does in her heels and knee-length dress. As I’ve listened to “C’est La Mort” and “To Whom It May Concern” today, they keep reminding me of two other songs of similar content: Respectively, Bruno Mars’ “Grenade” and John Mayer’s “Love Song for No One”. (If you are unfamiliar with either, the names will link you to youtube vids.) Of course there are several differences in both cases, but I think what truly sets The Civil Wars songs apart is their earnestness, and ability to sound convincing, whether on the subject of a love worth dying for or a non-existent, but yearned for love. I would say this quality is suspended into their concert performances. Although Joy and John are not a couple, but married to different people, they are able to hold such beauty and tension in their relationship to one another. Their partnership allows them to be so honest in their music, letting them be each other’s voices for pain and love in that way. They mean the words they sing, just not about one another. Amazing. Next comes the enchanting “Poison & Wine”, which still causes me to stop nearly any activity in order to digest more fully. The song comes across as a bottle of wine that I want to guzzle, and often once I’ve listened intently with eyes closed, I feel drunk by the end of it. I kind of wish Side 1 of the vinyl version ended there, but instead “My Father’s Father” brings the first half of the record to a close with a sparse and simple song. I feel as though this is the best kind of country music, because all though it is all about telling stories, they never spell it out too much for the listener, leaving plenty of room for us to fill in the blanks with our imagination. How literal or metaphorical is the grandfather’s blood on the tracks? It’s left for us to decide. I turn the record over and get picked back up with the album’s title track, “Barton Hollow”; the bluesy number that was performed at the Grammy awards. Continuing the trend of subtle stories, Barton Hollow becomes a home that can never be returned to, and is marked by the final line of the chorus: “Can’t no preacher man save my soul”. This is followed by instrumental “The Violet Hour” on piano, guitar and a little bit of cello, that ends with the piano mimicking a bell tolling. “The Violet Hour” reminds me how instrumentally sparse the whole album really is – the instruments are there to support the vocals, and the default attitude is that less is more. Sometimes a violin will highlight melody or add something a little extra, or a cello will give a foundation for the guitar lick, but for the most part, listening to The Civil Wars is all about lyrics, vocal harmony, and whatever may lend itself to these. As an example, “The Girl with the Red Balloon” has a very light amount of violin in it; other than in the moments that swell with tension and timbre, the song is sung over guitar chords and the odd cymbal roll. This is also what has the next song, “Falling”, always remind me of the music from Marketa Iglova and Glen Hansard from the movie Once. It probably also helps that they have a song with nearly the same title, “Falling Slowly”. Joy and John Paul’s voices once again are so believably full of experience and desire and pain. Although I am starting to feel bad about how much I am comparing the songs on this album to other artists and work, I have not mentioned the most obvious, which is Alison Krauss and Robert Plant’s collaboration on Raising Sand. There are many comparisons one could draw, but “Forget Me Not” seems like the one song that feels as though it could have been a B Side to “Please Read the Letter”. If someone had played me this song a year ago and told me it would be on my stereo on the regular, I would have laughed and made a hostile comment towards country music in general. Alas and alack, I have given in. If this is Country, I am a fan. Lower case f-fan only. “Birds of a Feather” closes off the vinyl version of Barton Hollow, and continues the theme of channelling Krauss and Plant… can channelling happen to living beings? Oh well. It’s fun, though minor, and leaves me wanting more. Altogether, I am amazed that such a sad sounding album could feel so alive and well. It is mostly in minor keys and either whispery-quiet, or desperately-loud, but it is honest and beautiful, and will long live on my future iPods. 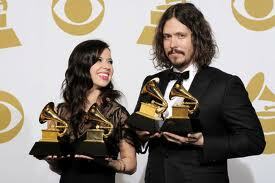 Congrats Joy and John Paul, on your Grammys and many new fans! I have been thinking about Kanye West quite a bit lately. Perhaps because of my favorite November game – attempting to predict the Grammy nominations – and now that they have been announced, My Beautiful Dark Twisted Fantasy has become the most talked about album, not only because of the nominations it has received, but also those it has evaded (namely, Album of the Year). What do I like about Kanye’s Beautiful Dark Twisted Fantasy? Well, to begin with, it’s a great title. The album not only embodies each descriptor, but holds them in tension with one another. The fantasy often leaves us (and Kanye himself) wondering if he’s bat-poop crazy, yet always in awe of the demented beauty in his stories and sounds. And sights too, if we’ve watched “Runaway”, the accompanying short film that makes use of all but 4 of MBDFT’s songs. But for now, this is a post about the listening experience, and the album begins with Nicki Minaj quoting(ish) from Roald Dahl’s “Revolting Rhymes”, setting MBDTF up as one of those classic, twisted nursery rhymes that we routinely censor and disney-fy. Not that I think we try to child-proof Kanye, but perhaps it’s on this album where he most deeply attempts to come to terms with the person that he feels he truly is, with the person of his celebrity. 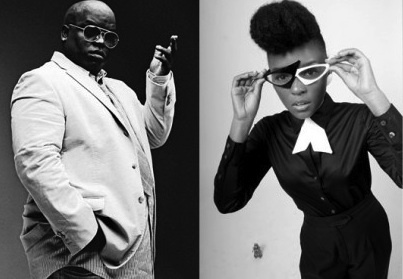 “Dark Fantasy” kicks off the album with an almost Moby-esque repeated line over piano chords, long before he funnels to the center of his psyche, peaking at “Monster” and then spirals back along a slightly different path, getting “Lost in the Woods” along the way, and finally wondering who can survive America – perhaps the source of his insanity. Kanye can’t help but offend most people at some point. He certainly would like to. But I appreciate that the shock is rarely for shock value alone; He actually has some really great motivations. The song that is getting the most Grammy attention, “All of the Lights”, is epically full of everything: guest appearances, horns, catchy hooks, and an anthemic sense of greatness. At face value, the song is about Kanye walking in on his girlfriend cheating with someone else, and him wanting to reveal the truth with the brightest lights possible. It may seem hypocritical if he weren’t starkly honest with his own imperfections on tracks like “Runaway” and “The Blame Game”. The whole album is really a call for turning on the lights – to quit hiding what we’re not proud of. I am finding it difficult to write about Kanye’s Fantasy in a linear fashion, and I wonder if the songs simply aren’t meant to interact with one another that way. We are meant to think of “All of the Lights” during “Hell of Life”, and we are meant to hear “Gorgeous” echoing in our mind when listening to “The Blame Game”. Kanye has provided transitions with intentionality and artistry that is hard to beat – it seems he is following a true and free flow of his own thoughts. The songs and themes feed into one another. Together the songs work at getting to the bottom of what makes Kanye West tick: they explore a mourning of his two greatest role models (his mother and MJ), his experience of celebrity, and his incredibly dysfunctional relationships with all female creatures; They bring some of the best and most eclectic artists in the business together, from Bon Iver to John Legend, to create something even better than Kanye could do by himself (GASP!? ); They creatively combine all the things Kanye has done best on his previous 4 albums: the raw, catchy hooks of College Dropout and Late Registration, the dark and epic sense from Graduation, and the experimentation of 808’s and Heartbreak. And I know I could say that he has done all of these things more successfully together on My Beautiful Dark Twisted Fantasy. Let’s rewind to some of the stand-out moments on the album. Because it was leaked early, many of us heard “Power” before anything else, and while it sounds like a political question, there is something personal about it as well. What is the power we have handed over to Kanye himself, or any one person for that matter, why do we do it, and does anyone deserve it? Meanwhile, KWest is not about to let go of any he finds. Even when he offers a confession of sorts in “Runaway”, we know it is a backhanded apology, as it proves that none of us are actually ready to run away from him. He knows he deserves to be dropped, but lets us know on an addictive beat and catchy hook. Recently for my birthday I was given Blood Bank, The Bon Iver EP from which “Lost in the World” gets its foundation (the song “Woods”). I keep listening to this song, trying to imagine Kanye hearing it and thinking, “I can make that even better”. In its own right, it is hauntingly beautiful. And although I know several haters (or Indie purists?) who will vehemently disagree with me on this, but there is something that Kanye really does add to this track. He seems to have made it his own, and although very different from Bon Iver stylistically, both artists seem to deeply wrestle with and understand the concept of lost in a deep way. For me, “Lost in the World” holds its own more than any other track on the album, and yet every song is given context within this bizarrely personal and introspective Kanye collection. Whatever you think of this egotistically, self-proclaimed workaholic jerk-off, MBDTF is an honest look at a complicated man that at its best calls us to question our own motives and behaviour, and at its worst sounds good. Sounds like a grammy-contender to me. I’ve been attempting to finish a post on the magnificent Janet Jackson’s Rhythm Nation, 1814 for the past couple weeks, but can’t seem to. I’m sure a large part of the delay is the fact that I’m awaiting a vinyl copy to come in the mail, and want to have listened to it once before finally publishing anything. That’s what you have to look forward to. In the mean time, I’ve been going through a bit of a music funk. I’m tired of almost everything I’ve heard before, but can’t seem to find the energy to listen to anything new. 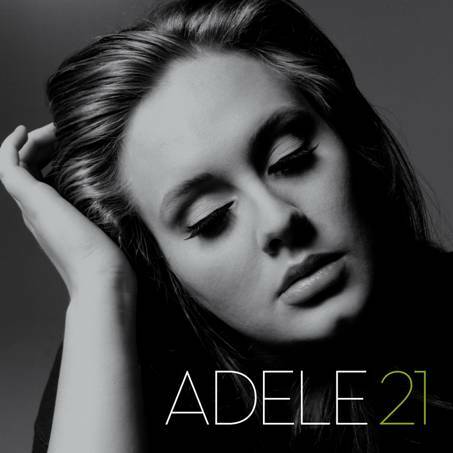 The one exception has been Adele’s second album, 21. Yes, it’s titled from the age at which she wrote the material, and yes, that throws me off every time considering the emotional depth and maturity that echoes through most of the tracks. I have to admit, this album is growing on me with every listen. As a follow up to 19 I immediately found it disappointing. Don’t get me wrong, I fell in love with “Rolling in the Deep” like everyone else, and was playing and re-posting her performance at the Brit Awards of “Someone Like You” along with the half of facebook. But after my first listen, I felt that the rest of the album couldn’t live up to these two power songs. As I mentioned, 21 begins with a bang. The album is an exploration of a particular breakup, but instead of opening with melancholy, Adele comes out swinging. There is indeed a fire in her heart, and it’s contagious. I guess the first two songs represent the anger stage of the grief cycle. That’s my favorite. “Turning Tables” jumps back in time to the moment she realizes a breakup is necessary, and although it’s a good song, it has an annoying tendency to get Rihanna’s “Unfaithful” in my head. I’m no Rihanna-hater, but this is really one of her worst. Still, I shouldn’t take out my feelings on Adele; it’s not her fault that Rihanna wrote a catchy tune that talks about being a murderer. The one song I haven’t changed my mind on is the next: “Don’t You Remember”. Adele, you are so much better than a shmultzy country song. 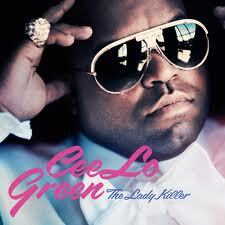 I know every breakup album needs a depression-infused-regret song, but this can not be it. I honestly think I would have enjoyed this album much earlier if this wasn’t included. And now that we’re past it, I can relax. It gets better from here; it’s a steady increase of good tuneage. “Set Fire to the Rain” is quickly becoming the spicy meat in my Adele sandwich… or lasagna. It’s the ideal Adele instrumentation that starts with piano at the foundation and builds through the verses to create a climax at the chorus with strings and an epic feeling chord progression. I love the punctuated piano shots of “He Won’t Go”, and I do tend to sing along, so perhaps it’ll still grow on me, but right now I’m mostly excited for the ballads to start. “Take It All” feeds that craving. Pure, soulful Adele-voice, with the tiniest dab of gospel choir. I kind of wish she saved this one until later, because it’s hard to go back to the poppy “I’ll Be Waiting”. Something about “One and Only” sounds like it should be in Dream Girls (Am I alone in this?). Maybe that’s why I feel like it doesn’t hit as hard as it might be trying to. I do LOVE the bridge, where she gives him a little understanding: “I know it ain’t easy, giving up your heart.” Almost wish it was a song in itself. Then Adele does something I never would have expected. She covers the Cure’s “Lovesong”. I really like this a lot by itself, but I’m still not sure how it goes with everything else. Are we meant to hear that she’s ready to love again, is it denial, or does she actually feel like she’ll love the D-bag forever? I’m a little confused. I forgive and forget everything that came before as soon as the arpeggios of “Someone Like You” begin. This son makes me melt all over, no matter where I am; I become that dork on the bus with the iPod who closes her eyes super dramatically, and worries everyone around that she might burst into tears, and no one will know what to do. But hey, you try to listen to this tragic tune without controlling your emotional reactions. Here’s that post I love to share. I have to go cry now, and no, I don’t have time to talk about whatever the bonus track is that came with my iTunes download.